The newest release from Brouwerij Lindemans is the next beer in their new botanical series. The first one was created in collaboration with Mikkeller and featured basil. The second botanical Gueuze they produced used elder flower and was called Blossom. Ginger Gueuze, or GingerGueuze as it appears on the label, features ginger root as the name implies. Lindemans uses their classic Cuvée René Gueuze for this series then infuse it with the botanical of their choice. The lambic used is a mix of 2 and 3 year old blended with 1 year old lambic. The 1 year old lambic still has quite a bit of residual sugar which the the 2 & 3 year old lack after being fermented dry by the wild yeast. The residual sugar will allow the yeast to carb up the beer once it’s transferred to the bottle. This allows lambic to naturally bottle condition without the addition of sugar or yeast. 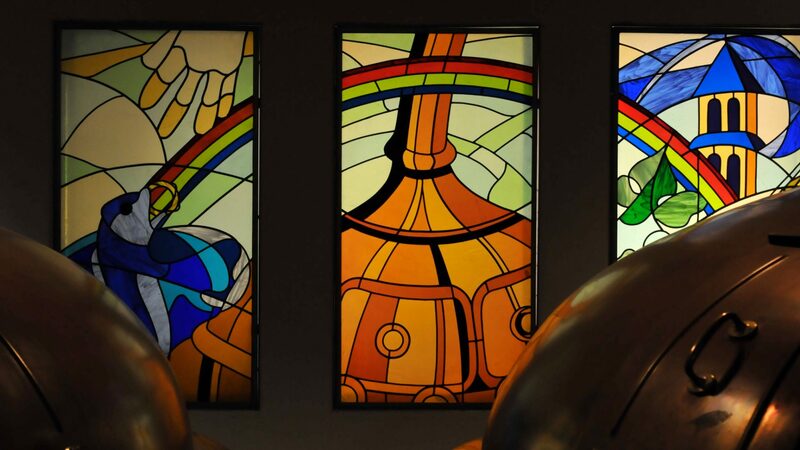 I had the chance to tour Lindemans during my recent Belgium trip then sat down with Dirk Lindemans to talk about the history of Lindemans and gueuze. It was a wonderful opportunity to learn about one of Belgium’s great producers and continue research into one my larger projects. It’ll be appearing on this site in the coming weeks. Appearance: Gold with a light haze, off white head, good retention. Aroma: Ginger, earthy, blood orange, orange, spicy. Taste: Ginger, light meyer lemon, juicy. Overall Impression: The ginger is front and center in this tasty lambic. You get a lot of ginger zing and zestiness with just a hint of ginger bite. The tart fruitiness of the lambic comes through nicely and blends well with the ginger creating a very juicy and fruity. The lambic also adds a bit of earthiness to add a bit of depth and complexity to the mix. Availability: Limited special release, imported by Merchant du Vin. Disclosure: This bottle was given to me by Dirk Lindemans after my tour. Thank you!